Saul Goodman is the criminal defense (emphasis on the criminal) attorney for Walter White and Jesse Pinkman on AMC’s Breaking Bad. ​Saul is willing to do whatever it takes to win for his clients, even if that includes calling in one of several “problem-solvers” under his employ, who operate outside of the law at his request. What Kind of Jackets Does Saul Goodman Wear? Where Can I Get Saul's Pants? What Accessories Does Saul Goodman Use? It may come as a surprise to learn that many of Saul’s jackets are not unlike those he wore in his early days (as Jimmy McGill). 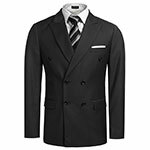 ​The kinds of jackets that Saul has been noted to wear are most often double breasted sport coats. He has been noted to have these in black, black pinstripe, gray pinstripe, gray textured, and beige checkers - just to name a few. Saul’s shirts and neckties are arguable the most vibrant and colorful articles within his wardrobe. He is noted to wear most often button down dress shirts in a rainbow of different colors. ​Saul’s shirts have been noted to come in: yellow, green, blue, red, and pink - and that’s just what I can remember off the top of my head. Here’s just a couple great matches that I was able to spot immediately. Saul’s footwear is a subject of little discussion really. He has been noted to wear most often: black Italian style loafers with a metal buckle or other adornment. ​These black Italian style loafers by Bruno Marc are a perfect match to the style of footwear Saul Goodman has been noted to make use of. 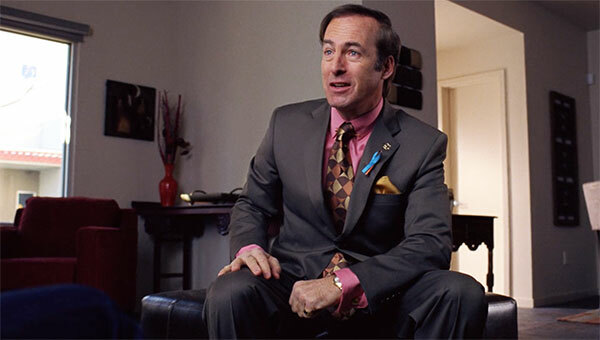 Saul is known to make use of several different accessories in his appearances on AMC’s Breaking Bad. Some are more functional, like for example his “World’s Greatest Lawyer” coffee mug. ​While many are simply for aesthetics as Saul favors his image to be synonymous with success. These might include his bluetooth headset, pocket square or cufflinks.